Overall I'd rate these gloves a seven on a ten point scale. They are still quite warm and comfortable for being fingerless. The fabric does shed a little bit and I find myself picking it off my coat every once in awhile. However the gloves are still super soft and the fur is beautiful. 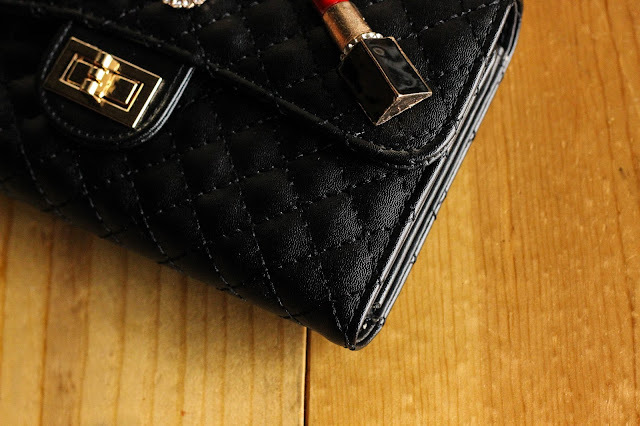 After browsing SheIn I came across this embellished quilted long wallet ($22) and I knew I had to share my new wallet/obsession. It seemed so fitting since I am reading Coco Chanel an Intimate Life. 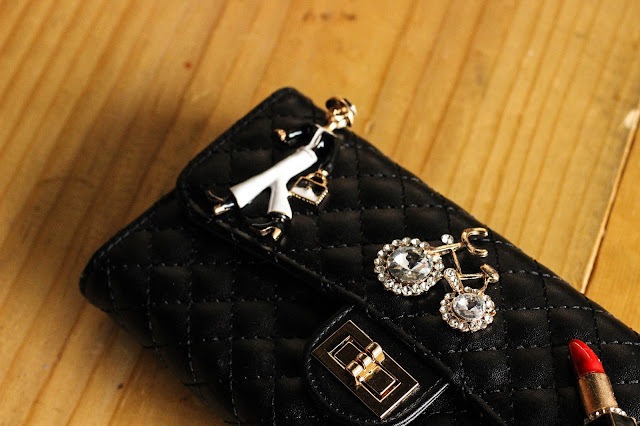 I love the little embellishments especially the one that looks like Chanel. Since Emily Gilmore and I Marie Kondo'd our lives (read about it here, gif here) I've been trying to add things to my closet/life that coincidentally bring me joy and can be used hundreds of times. This wallet is adorable and a great piece since I can use it as a clutch. There are 10 card holders (very important to me) and a slot just for your ID. There's plenty of room in this wallet for cash. On the back side there is a little pocket, perfect for receipts. 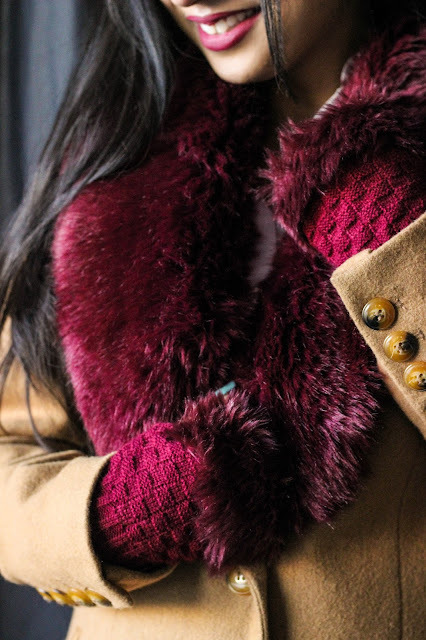 Below is my round up of women's gloves and mittens. The Who What Wear pair is next on my list! Happy Friday! I'm going to yoga tonight and going to catch up on Grimm. What are you doing this weekend? The details on that wallet are so pretty! Love this look. It's just a wonderful pics! Just lovely! I have totally been thinking about pulling a Marie Kondo too! And I love the fur trim on those gloves. So sassy and chic! Its so liberating isn't it? Thanks Yasmin! That's a gorgeous bag and I LOVE your faux fur gloves! Lovely gloves! The colour is fab. 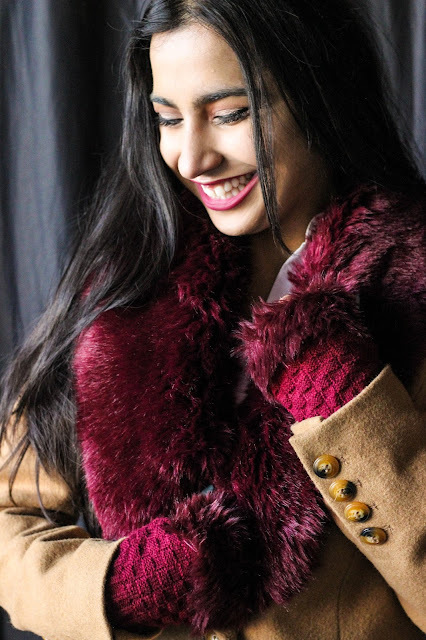 I love both the scarf and gloves, the colors gorgeous and saturated, so perfect for both fall and winter! 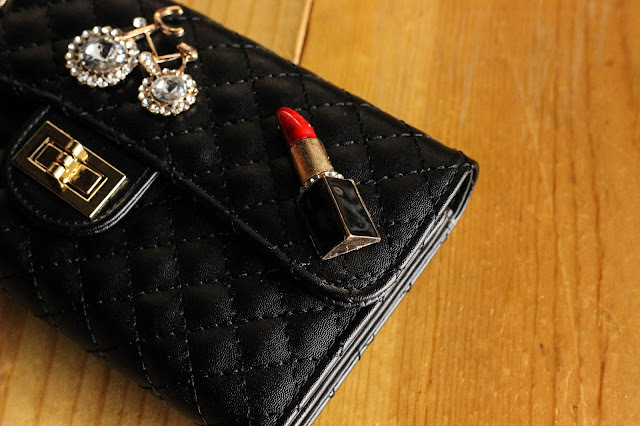 I also adore that wallet/clutch too, so cute and trendy with the pins! Thanks for sharing, beauty, and I hope you have a great weekend ahead! 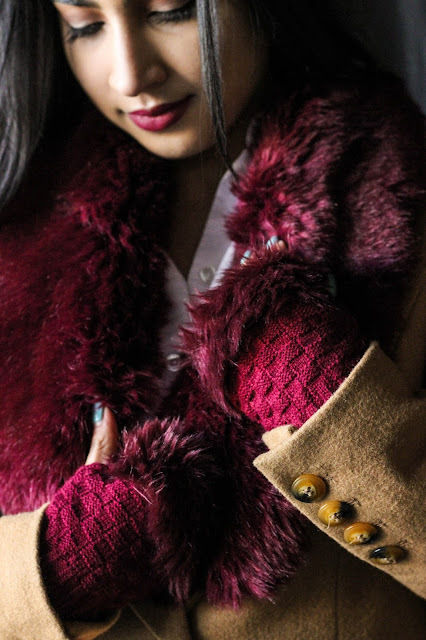 loving the gloves, such a gorgeous colour and the outfit is amazing. That clutch is gorgeous and makes such a statement! Shein is a decent site but I think it's important to read lots of the reviews, the quality can be hit and miss. Totally agree Shireen. I ordered these both at random but I've heard some bad reviews. I tend to stay away from clothes and only buy accessories. Aww how cute are those gloves, and I love the wallet too. I feel like I often neglect to buy winter accessories and then end up needing them and have to settle on what's left in Target after it's been picked over. Ha! I need to find some fun gloves though. I hope you have a great weekend Sonia! Target does have some good picks Mme! Likewise! Aww the Coco Chanel wallet is the cutest thing! I love your wallet and I can see how it'll bring joy, it's so pretty, I loved that Gilmore Girls episode too haha. Thanks Rosy! Haha that episode was probably one of my favorites. Love the burgundy gloves and your new wallet. It looks very classy and elegant. It is so beautiful! 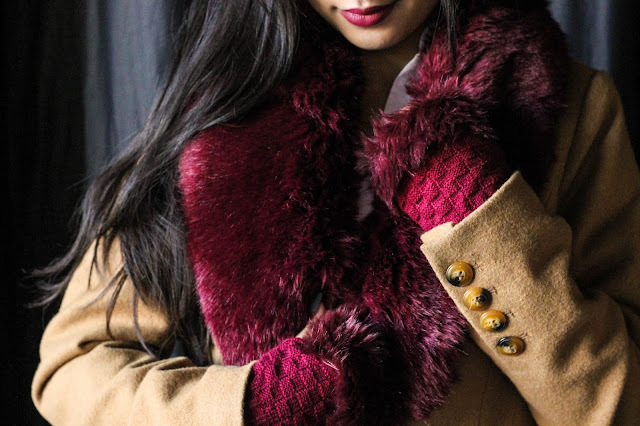 Those burgundy gloves are so pretty! I love the color! Thanks Cielo, all by my friend Mallory. I love the color of those gloves, so pretty! 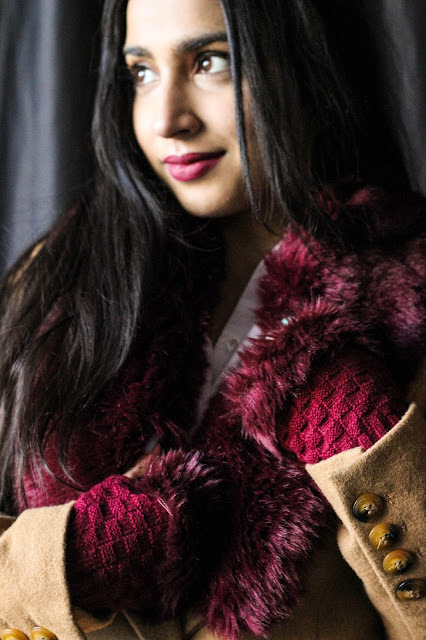 Loving the burgundy here, lady- gorgeous! They look so warm and gorgeous color! They come in such a perfect color too! Thanks Jeannie I think so to!